Casmir was a prince of Poland, and he sometimes struggled with shaving to choose between his father the King and his heavenly Father, the King of Kings. Once, his dad sent him with an army to take over the throne of Hungary. Casmir knew in his heart this was wrong, but he didn’t want to disobey his dad. When his soldiers began to desert on the way to Hungary, Casmir turned around and went home. His dad sent him away to a castle in a remote city to punish him, but Casmir only grew stronger in his desire to please God, even if it meant refusing to do what his dad asked him to do. Saint Casimir use to sleep very little, staying up late to pray. When he died, his favorite hymn “Omni die dic Mariae" was played at his funeral mass. Listen to the Benedictines of Mary, Queen of Apostles sing it, and maybe you’ll see why it was such a favorite of St. Casimir. 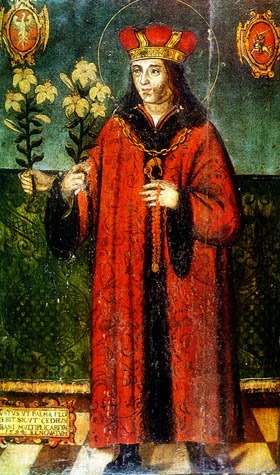 Saint Casimir, pray for us!